According to his military service records, James Shelby Morgan was 24 years old, a resident of Princeton in Gibson County, Indiana, and had just earned a Bachelor of law degree from Indiana University when he was commissioned as a 2nd Lieutenant by Indiana Governor Oliver P. Morton on August 17, 1862. James enlisted 2 days later in what became Company E of the 80th Indiana and was mustered into the Union Army at the rank of 2nd Lieut. for a 3 year term of service on September 3, 1862 at Camp Gibson near Princeton, Indiana. As 2nd Lieut., James was third in command of Co. E after 1st Lieutenant Alexander Montgomery, and Captain Harrison M. Spain (its commanding officer). Lieut. Morgan was recorded as "Present" with the 80th from September 3, 1862 until early November 1862. On October 8, 1862, the 80th took part in the bloody fighting at Perryville in Boyle County, Kentucky. This was just 30 days after the regiment had first drawn its uniforms and weapons. During 2 hours of heavy fighting the 80th lost 25 men killed, 116 wounded, and 16 captured out of the 738 men it took into the battle. This was a 27% casualty rate, and amounted to 45% of all casualties the regiment would suffer during its entire service. It is said that one of the wounded was Lieut. Morgan. Starting November 5, 1862, Lieut. Morgan was recorded as "Absent sick at Danville, Kentucky." Lieut. Morgan was next listed as "Present" with the 80th starting sometime in January/February 1863 until June late 1863. On June 4, 1863 Lieut. Morgan accompanied a group of 80th officers on a sightseeing trip from the regiment's Glasgow, Kentucky camp to visit Mammoth Cave. Starting June 28, 1863 Lieut. Morgan was recorded as being "Absent sick at Glasgow, Kentucky." For July through September 1863 he was listed as "Detached as Ordinance Officer at Glasgow Ky. by order of Col. Hobson commanding 2 Brigade." In Lieut. Morgan's service records is a letter dated September 14, 1863 that he wrote from Glasgow requesting a 20 day leave of absence "to attend to the wants of a Widowed Mother who is depending on me for support and to settle business of my own which cannot be affected without my presence." This request apparently triggered an official inquiry, dated September 16, 1863, by order of US Brigadier General J. T. Boyle, commander of the District of Kentucky. He wanted to know "by whose orders [Lieut. Morgan] was detached as Ordinance officer at Glasgow Ky. & what are his duties." The Glasgow Post Commander, Col. Selby Harvey, wrote back on September 21, 1863 that Lieut. Morgan was detached by order of Col. Hobson and that his duties "have been very arduous as there have accumulated here a great quantity of ordinance left by regiments that had started with more ordinance than they could furnish transportation for. These are furnished to arm & equip detachments arriving here as needed." It is not clear if Lieut. Morgan's leave of absence was ever approved, but he did get married in Glasgow a few days later. For October and November 1863 Lieut. Morgan was listed by the 80th as "Absent at Knoxville Tenn. making Ordinance report." Starting December 15, 1863 he was recorded as "Absent sick at Knoxville Tenn." and from the end of April through July 1864 he was again listed as "Absent Ord. officer Glasgow Ky."
In his service records is a handwritten letter by Lieut. Morgan dated May 10, 1864 from Glasgow requesting an order sending him "to Louisville Ky. for the purpose of meeting an Inspecting Officer on the 16th of May to inspect ordinance now in store at Lt. Bobbitts Ordinance depot Louisville Ky. for which I am responsible." His request appears to have been approved. On May 14, 1864 the 80th took part in very bloody fighting near the town of Resaca, Georgia. That afternoon the regiment suffered 26 killed and 100 wounded out of the 270 soldiers it took in that battle, a stunning 47% casualty rate. Also in Lieut. Morgan's service records are three related documents. One is a copy of an extract from Special Order No. 10 issued August 2, 1864 by Brig. 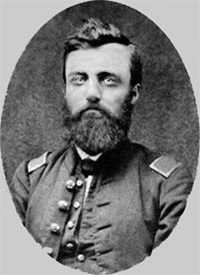 Gen. McLean, commander of 1st Division District of Kentucky. It states that Lieut. Morgan "now at Glasgow Ky. is hereby ordered to proceed immediately to Marietta Ga. and report to the commanding officer of his Regt." The second document is an undated letter by Lieut. Morgan, addressed to the "Head Quarters" of the 80th, in which he writes "I have the honor herewith to tender my resignation as 2nd Lt...for the good of the Service of the United States." The other document is a letter dated August 24, 1864 written by the 80th's then commanding officer, Major John W. Tucker. At the time the regiment was taking part in the final weeks of the Federal siege of Confederate-held Atlanta, Georgia. The Major's letter contains the following statements, and was forwarded up the chain of command along with Lieut. Morgan's resignation letter. "Lt Morgan has been absent from his company since Nov. 62 with the exception of about two months that he was on duty with his company at Woodsonville Ky... [He] has managed to dodge every effort that has been made to get him to his command." Maj. Tucker added that when Lieut. Morgan was finally ordered back to the 80th he failed to obey, remaining instead at Glasgow and applying to resign. The Major urged that the Army speedily approve the application. Lieut. Morgan's resignation was accepted effective August 26, 1864. At that point Lieut. Morgan's company consisted of just 34 enlisted men (down from its original roster of approximately 95 enlisted men some 2 years earlier) plus 2 officers, Capt. Spain and Lieut. Montgomery. Ironically, no one was promoted to fill its 2nd Lieut. vacancy before the 80th was disbanded some 10 months later after the war ended. James and his wife lived in the Glasgow area until 1876 when they moved to Arroyo Grande on the Central California coast. There they homesteaded land in the Los Berros Canyon. In 1912 he began receiving a pension of $30 per month for a wound he suffered at Perryville. Three years later James passed away of "Angina Pectoris" at age 78. For more about Lieut. Morgan's experiences with the regiment, click the 80th History link below to read what happened during for the months he was present with the unit. If you have additional details about him that you would be willing to share, then please contact Scott C. Meeker using the link below. Sources: Genealogical data courtesy of Lieut. Morgan's Great Great Grandson Matthew H. Morgan; Personal diary of Capt. James P. Glezen, Co. H, 80th Indiana; Civil War Compiled Military Service Records by Office of Adjutant General of the United States (Washington, DC) and Regimental Descriptive Rolls, 1861-1865, Volumes III, IV, and VIII, Report of the Adjutant General of the State of Indiana (Indianapolis, Indiana, 1866). All Rights Reserved. Created November 22, 2004. Last updated February 14, 2005.